Like Merchant Ships: What can I say? 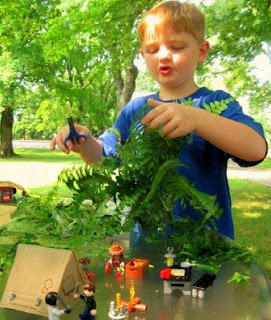 We frugal moms hope our kids will love making things. Mine must have been watching me get the most from my potted fern all summer. Still, I never expected to see an arrangement gracing this Indiana Jones diorama. "So it looks all wild and jungle-y." Nor its trimmings firmly affixed to the tabletop with packing tape. "So they won't ever come off in the wind." Or, you know, with Windex. Just wait until this boy's age and expereince catch up to his imagination. My brother was the same way, at times it was exasperating, but now you'ld never meet a better problem solver or handyman. Don't you just love it when kids run with their imagination? Too cute!! What a creative little guy you have there! precious.....P R E C I O U S !!! Love his explanation! I've had success taking off adhesive with either peanut butter or the concentrated citrus essence cleaners, used very strong or undiluted. Glorious! Packing tape adhesive is pretty awful though. We have never managed to get the sticky adhesive manufactureres labels off our windows which are some fancy kind of plastic so I can't scrape! 10 years on, I'd love to know the remedy! Inspired by your fern post earlier I purchased one too and used it, with other assorted potplants and a birdcage to fill our fireplace. It has looked lovely all summer, so thank you! Gill. I love it. You can tell he is into his project. He will probably be as talented as his Mom.